Basalt is a dark, volcanic rock that naturally displays a columnar structure. Small-volume basaltic volacanism has occurred intermittently throughout central Mongolia for the past 30 million years. Mongolian basalt is found in the mountains found between Russia and China. 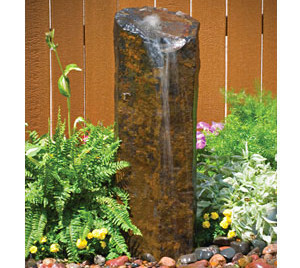 It is mined, shaped and then drilled to make a stunning semi-formal water feature. Since each piece is handcrafted from natural stone, some variations in size, color, weight and texture may occur. Who is This Product For and Why Should You Buy it? Mongolian Basalt columns are for anybody who wants to spruce up their yard or landscape. 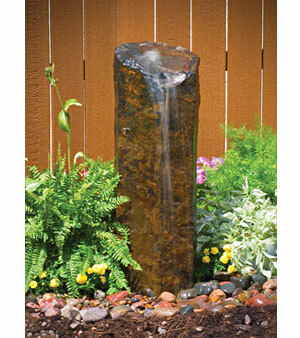 A single Mongolian Basalt column can completely transform any yard or landscape. They are exotic, yet because they are naturally occurring, rather than manmade, they look especially great in yards and landscapes going for an au naturel look. Though Mongolian Basalt columns will fit in and look great in any yard or landscape. Whether within or next to a garden, beside a birdfeeder, or anywhere you decide to place it, you can’t go wrong with a Mongolian Basalt column, or columns, in your yard or landscape.